In our article Simple Solar Water Pre-Heating System we introduced a design for pre-heating water before it passes through a combi type (tankless) boiler. The water fed into a combi boiler comes directly from the mains supply, and is typically at around 13 degrees Celcius. This is then heated in the boiler to your chosen temperature setting – e.g. 50 to 65 degrees Celcius. Every degree by which the mains water can be (pre-)heated before it reaches the boiler will reduce the electricity/gas required to get it up to the target temperature, and therefore save money and reduce your carbon emissions. 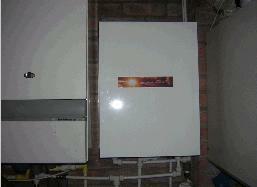 A new product has come onto the market designed to use solar power to supplement the heating effect of a combi boiler. Called Solar Storage, this system comprises a completely assembled water storage tank with expansion vessel, pressure release valve, air vent, mixer valve, and electric control for the supplied 12V solar water pump, and can therefore be installed by a competent DIY installer. Two different sizes of storage tank are available – 10 litres (SS10) for usage with a sink, and 100 litres (SS100) for usage with a bath. The SS10 system is priced at £800, and the SS100 at £925. These prices do not include the cost of a suitable solar water heating panel. Any plumber would be able to install this system in less than a day of labour. For full details on the Solar Storage system please click here to view the official Solar Storage website. I like the look of these products, but your information is wrong – DIY installation of the 100 litre version can only be carried out by a “competent person” – see section G3 of the building regulations. 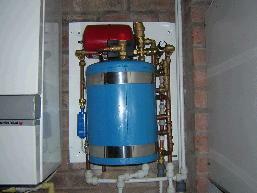 Installation of an unvented cylinder of this size without a suitable qualification is illegal.